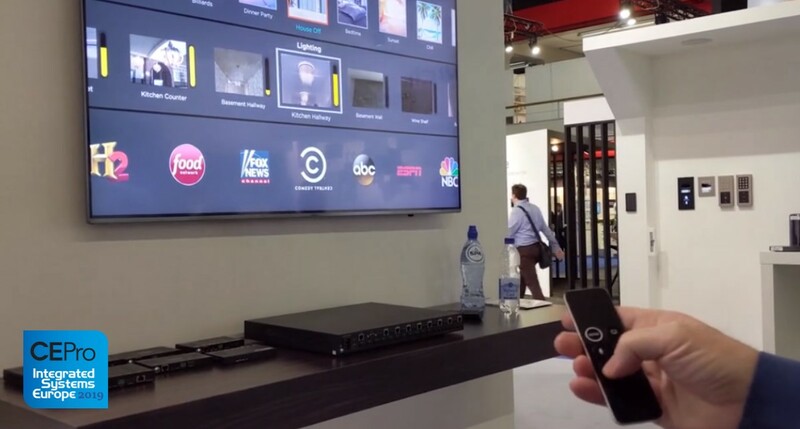 Savant, a world leading manufacturer of smart control and home automation solutions, launched at the recent ISE 2019 one of the first-ever (sanctioned) two-way integrations between Apple TV and a third-party home automation system. The company demonstrated smart-home control via on-screen display (OSD) using Apple remote at the world-renowned trade show held at the beginning of February. Their demonstration showed how anything in the Savant smart-home ecosytem could be navigated and controlled through an on-screen display (OSD) via Apple. Such 2-way integration was made possible by Apple’s announcement of a long-awaited API for two-way IP integration toward the end of last year. At the time, Control4, Crestron and Savant were reported as the company’s first three home-automation partners. To date it appears that Savant are the only company who have developed an OSD implementation. That implementation went down well with ISE 2019 attendees who were treated to a display of the capabilities offered by the integration. An Apple Remote was used to pull up Savant services on the TV and to navigate through a three-level UI featuring home-automation scenes at the top, connected devices and rooms in the middle, and favourite channels along the bottom. The demonstration also showed off how a user could navigate to a set of lights in a particular room, and then use the touchpad on the Apple TV remote to dim or brighten them. The real rime responses of the lights were then displayed on a thumbnail image on the TV’s OSD. If you would like to discuss your requirements for Savant home automation solutions please call us on 0800 195 4825.